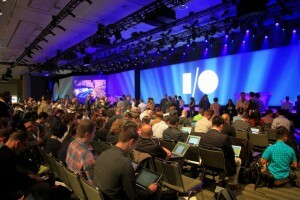 The first Google I/O was held in March 2008. This year Google had its 7th conference. A constant topic on these conferences is Android. Other topics include products that Google has been working on: Google Maps, Google TV, Google Music, Google+, Google Now and so on. These conferences are the highlight of the year, where the “googlers” get to show off their hard work of the past year. They manage to amaze and push the technological boundaries every year and raise issues of the not so far future. 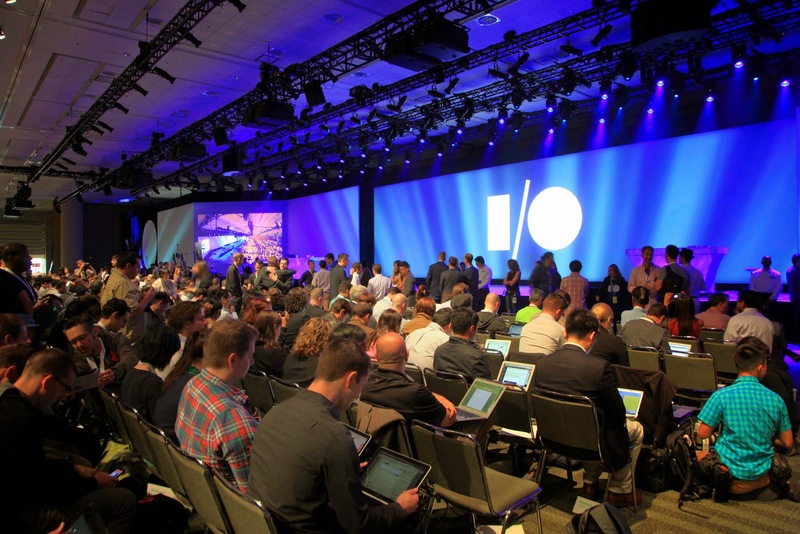 This year, I was one of the lucky once to receive a Google I/O ticket which “teleported” me to California to attend the Google Developer Group (GDG) Summit at the Googleplex in Mountain View and the Google I/O conference in San Francisco. 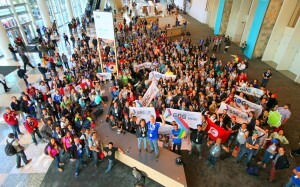 First of all: what is Google Developer Group Summit? GDGs are groups of people “who are interested in Google’s developer technology; everything from the Android, Chrome, Drive and Google Cloud to product APIs like the Cast API, Maps API and YouTube API“. 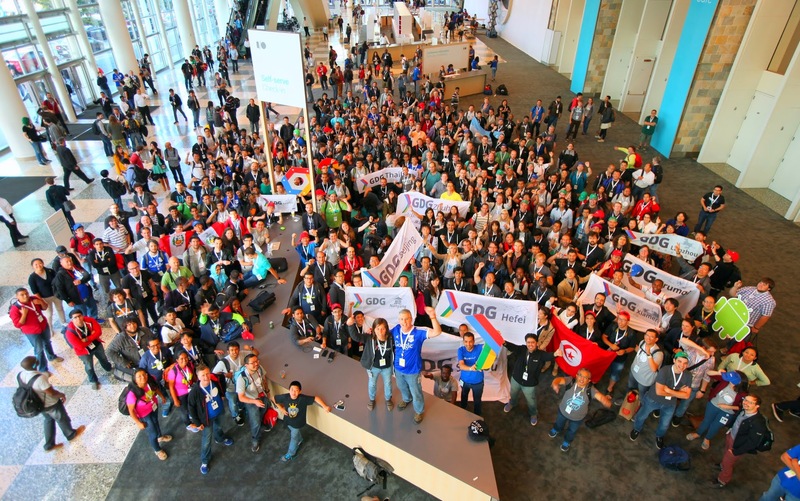 GDG members volunteer and organize tech talks, events like code sprints, hackathons and much more. The Summit is the event where some of the members of such groups, which are world wide, get together and share their experience. There are 500+ GDGs in 100+ countries to date. These GDG communities are supervised by some people who work at Google. They work in Google Developer Relations as Developer Community Advocates. However, GDGs are independent local groups which choose which events they want to hold and what to talk about in their meetings. Next you see the map of all teh GDGDs in the world. 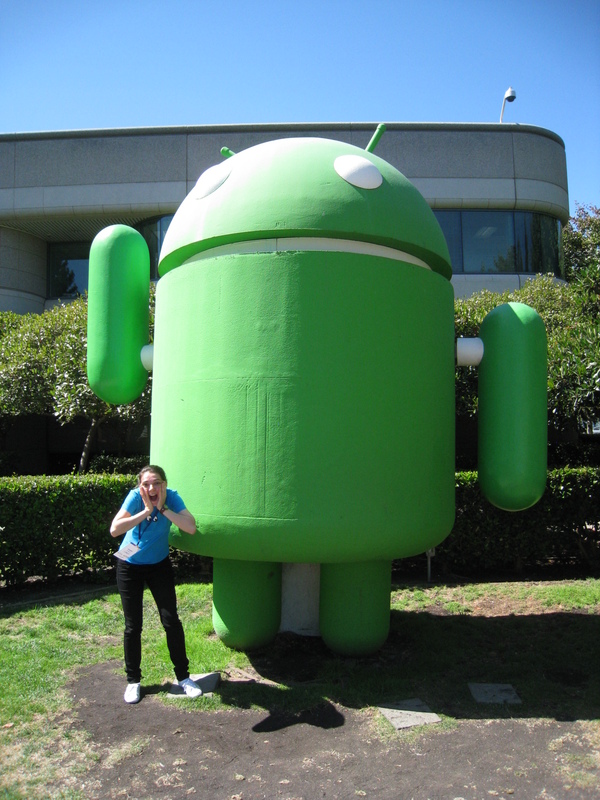 The 2014 GDG Summit was held at the Googleplex in Mountain View and it was a 3 day event. We were 350+ participants from all over the world, from South America to New Zeeland (see the above picture). The first day was “arrival day”. We were offered pickup shuttles from the San Francisco Airport which brought us to the hotel where we were hosted. At the hotel, everyone could check in and register for the GDG Summit by taking their name badge. Each organizer was sharing a hotel room with another participant. The official program started only the second day earlier in the morning. We were taken with the shuttles to the Googleplex where breakfast was organized, outdoors this year. Afterwards we moved to our conference room where we had different sessions. We started with a short overview of the past events we organized in different GDGs and went into specifics for the Women Techmakers (WTM) events. The WTM events were held in 49 countries during the month of March. We reached 10.000 developers from which 70% were female participants. 82% of the speakers of this events were women. Another session was about Engaging organizers. 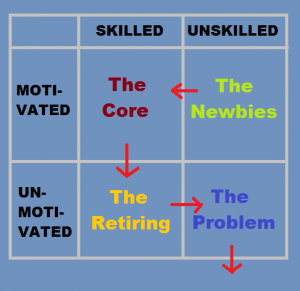 We talked about motivators, the cycle of membership, rewards and recognition for different roles that organizers have in the GDGs and about solving conflicts. 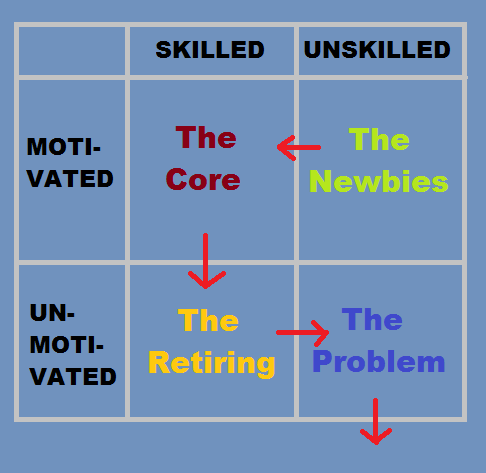 A very interesting chart of types of members is shown in the next figure. If some of them look interesting one can check out the slides here. And the full agenda of the conference can be seen here. The first conference day was closed with dinner and a Talent Show organized by the participants themselves in the room where we had the sessions. Dinner was proceeded by a cultural sharing of everyone’s local food or drinks and swag from their different organized events over the last year. It was a multitude of colorful pieces of culture combined with different personalities of wonderful people. The Talent Show was a hit with live music and dancing in a cozy, comfortable environment created over the day. 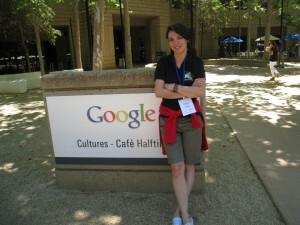 The second day, we were taken again with the shuttles to the Googleplex Campus where we had breakfast. The second day was dedicated to unconference sessions where you could choose the discussion topics you wanted to attend. We also had time to visit the Google Store on Campus and have lunch (this time at the actual Google cafeteria which has great food). After a Google Glass Design session we got in our shuttles and got to San Francisco. 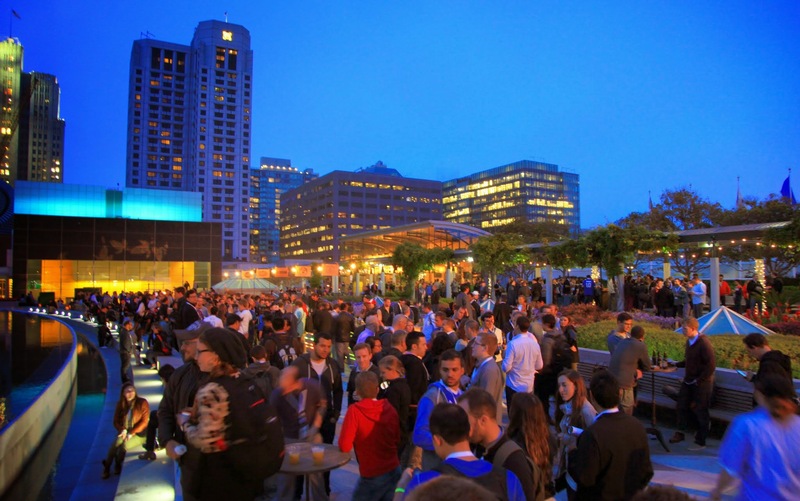 In town we had time to check in at our hotels and most important check in at the Moscone Center for the Google I/O. At the registration I got a name badge with NFC, a T-shirt and a water bottle with the I/O logo on it. People had different evening events or just rested in their rooms but the women that participated at the GDG Summit were invited to a special Women Techmakers Dinner. At the dinner I found out that in the restaurant were over 500 women from different volunteering organizations from the Bay Area: PyLadies, RubyGirls… and of course GDG Women (from all over the world). It was this event where I met Megan Smith from Google [X] who ignited interesting women topics among us. It was amazing to see how we all connect on different issues or challenges we have in our professions no matter which country we were from. More about the GDG Summit can be read on the official event website. At the Google I/O we were offered each morning breakfast at the ground floor, in the big hall. There were a lot of tables organized and buffet food on the margin. The lunch was the same, except with more people standing in line. On the first day, everyone was standing in line outside to enter the keynote. The line got quite long. As GDG members we had a separate waiting area. This year it was in front of the press entrance. We got to enter the keynote hall before the line of the people outside. We had reserved seats right after the press line. To be there live and on great seats awaiting the countdown was already super exciting. At this keynote, Larry Page did not get on stage to talk but I did see him enter the hall. Watch the keynote yourself on the official website. During the event there were two manifestations. The first one was a woman who stood up in the front row and held a placard with something written on it. She was complaining about the real estate situation in San Francisco due to Tech companies. And the second person was a guy who started to shout quite loud disturbing the current speaker on stage. He was shouting something like “Google is building killer robots”. Both people were removed by staff. At the second guy someone from the public shouted back “Go home!” as a reply to his accusations. The keynote was exciting for me also because of these disturbances. During the rest of the conference more presentations and talks were held. You could chose what you are interested in and join. I had two personal favorite presentations. One was about “The Pirates” who work on projects like Tango and ARA which I was interested in. The second talk I liked most was the “Biologically inspired models of intelligence”. I like Ray Kurzweil’s presentation about the future of technology which I felt was missing from the keynote. Last year Larry Page answered some questions which involved this point of view. Besides the talks, there were different stands organized where shorter talks or presentations were taking place. There also was a codeLabs corner and a Google Glass corner at the ground floor. Also, on the second floor there was a company corner with Duolingo, Runntastic and some more. 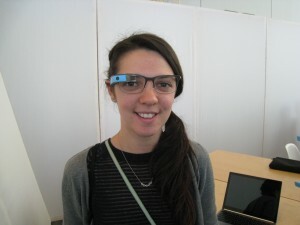 At Runntastic you could win a Google Glass if you held the record in squats over the conference days. At the Google Glass corner one could try Glass and take a virtual tour of the history of so called glass wear. One could also buy the Google Glass there. At the Android Car station one could try out the new presented innovation at the keynote. For GDGers there was a GDG Lounge organized, where we could hang out, share ideas or experiences from the ongoing conference or watch live some of the talks on big screens. 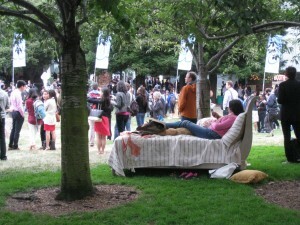 After the first day, there was a dinner party organized outside in a garden like place in the center of San Francisco. There was a silent disco and life music. The food and drinks were served from different food stands and for free. To chill and network there were beds and comfortable corners placed on the grass. The atmosphere was great and the view was amazing looking over the close skyscrapers covered in mist. On the second day we received our Android Wear. You could choose between a Samsung and an LG watch. Both were looking great! I chose the LG Watch. In order for the LG watch and the cardboard gadget to properly work one needed a good phone which had at least NFC or Android v 4.3. After the second day, as GDGers, we were all invited for dinner at the Google San Francisco office. After eating we had a party corner with music and dancing. People who left sooner for the airport said goodbye sooner and the rest said goodbye when the party ended at around 23:00. The next morning/day you could still meet GDGers in San Francisco, either shopping or sight seeing. Some people decided to stay longer or make a US trip out of it. Now in Vienna, after almost 2 weeks after the event, the GDG G+ community is full of pictures and posts about what we all 350+ people experienced. The GDG developers already started releasing the first apps for the Android Wear. We received “Thank you for participation” E-mails where we were asked for feedback. And the GDGers already start planning their new events and talk about new dev challenges. 😉 More pictures from the events can be viewed here.